Visions of Jesus Christ.com - Our Lady of the Rosary, hemography. 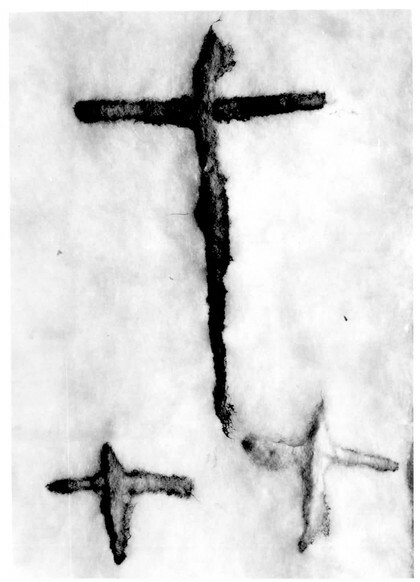 Photo of Our Lady of the Rosary Cross hemography. Story from Charles J. Herbert Sr. Image of Our Lady of the Rosary (Madonna del Rosario delle Lacrime di Sangue) weeping tears of blood at Maropati (Reggio Calabria) Italy, Holy Thursday, 1975. Flowing blood forms cross on cheek (also a heart?) One might meditate on symbolic significance! This is only one of a number of bleeding images in Italy as documented in Segno Dei Tempi? book. Also see Roschini's [Teresa Musco] for many bleeding images connected with Teresa; also her bleeding stigmata. In many apparitions, over 100 years Mary has asked all to pray her Rosary, has worn it, held it, taught it. Photo/story from book titled Mary, Why do you cry? Written by Father Albert J. Hebert, S.M. Images from [here].